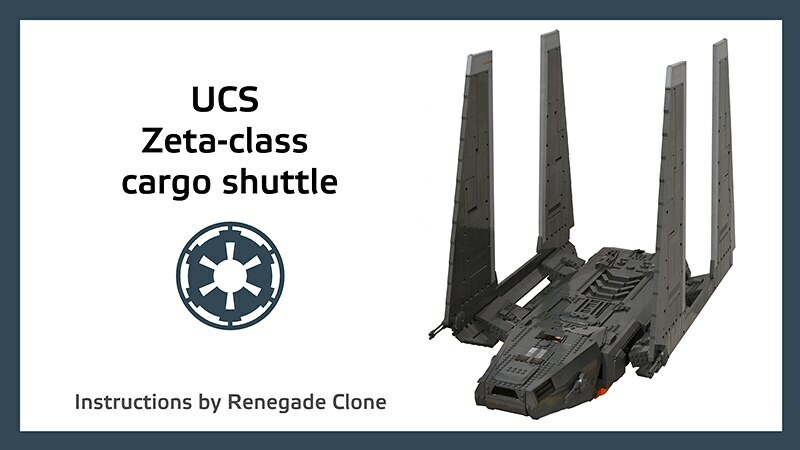 After receiving so many enquiries seeking instructions for my Zeta-class cargo shuttle, I am pleased to announce the release of a professional 768 page instruction manual for purchase. The final piece count is 4418, just surpassing 75159 Death Star. The completed model measures 70 x 56 x 38cm (wings upright). I have put together a package that includes the 768 page pdf instruction manual, parts list and LDD file. All of it is available for 25 British pounds (£25). If you would like to purchase the plans, please either PM me or contact me at renegadelight@googlemail.com. I will have a public parts list uploaded to rebrickable very soon (for simplicity, red coloured pieces can be anything you like, they are not visible from the exterior). I’m sure everyone appreciates the long hours that went into designing both the physical model and step-by-step build. I had a lot of fun putting this one together and hope others will too! 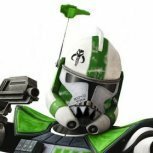 The Rebrickable parts list is now live here. 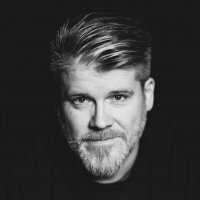 Please feel free to use this thread to discuss anything about the model design, building steps, part substitutions, etc. $30 is a small price to pay for so much quality and effort. OMG! Now this is one impressive MOC to build! Will be contacting you soon! This model is amazing... Want. So. Bad. Did you use BluePrint to generate the instructions? If so, I feel your pain... It can be very tedious. The (x7) 6x6 orange plates are not visible. They can be substituted for 6x6 or 6x12 plates of any colour. The 10x10 stud area (in front of what becomes the door into the cargo pod) can be tiled however you like, particularly with jumper plates for minifigures. 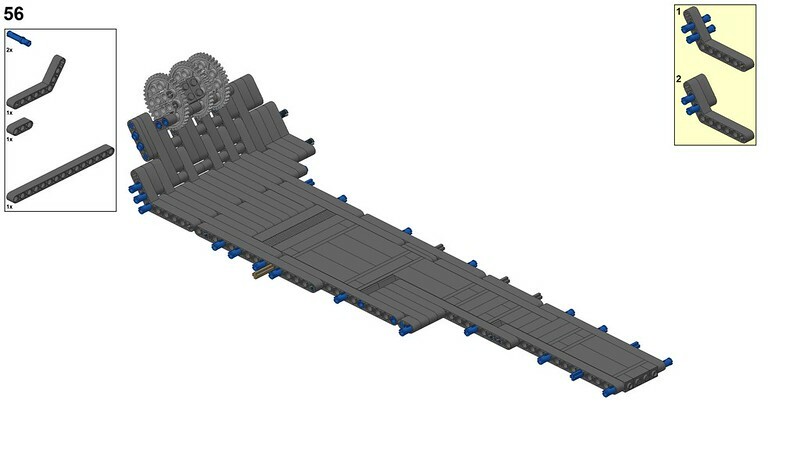 The only geometry clash that I found in LDD was with the left + right 3x6 wedge plates (added on pages 98 + 122). It works on my physical model, but you could change them for a right + left 1x3 wedge plates (but it would leave a small gap). Any pair of stacked 1x2 bricks can be substituted for a 1x2x2 brick (you could switch out all x88 for x44 if you want). While carefully supporting the wing upright, remove the free sitting Technic Axle 11 (newly available in the 2017 Y-wing) and replace through the (x3) Gear 40 tooth. Don’t forget the (x2) 2L pin connectors! There is enough flexibility to squeeze the wing linkage into the rear wing. The proper ‘official’ way would involve fitting both wings at once, but that would require help to hold it steady and insert the axles. The topside panels remove for ease of maintenance and adjusting the worm gears if required. Let me know any other ideas if you have them. The thing I love on your MOC is that it seems like an official Lego product in its technics and look, it's not common at all that MOCers do such a job. Just received my copy of the instructions today. From first look they receive a clear "double thumbs up" from my point of view. After importing the parts list into BrickStore i let the prog calculate an overall estemated price range for all parts. 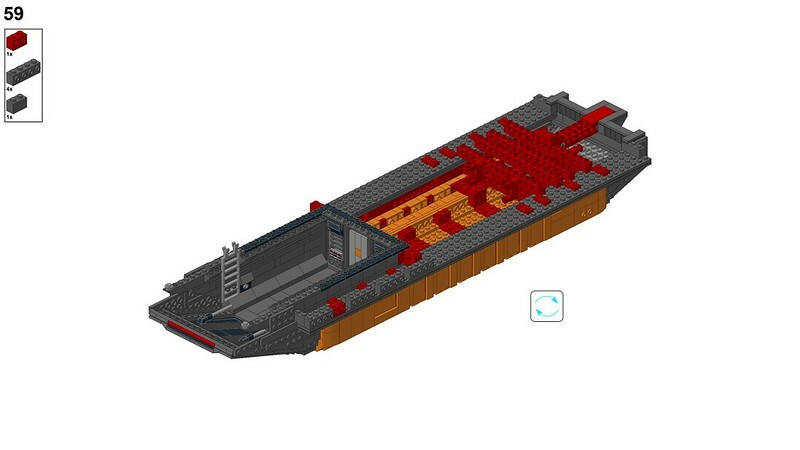 The model seems to be in the 600 € range (all parts in new condition, not including the necessary porto for needed bricklink orders). 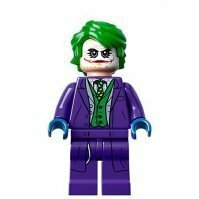 Time and several bricklink orders will tell if this price indication is valid or not ?. Maybe a stupid question, but, is it possible to display this on a stand? I haven't seen a pic of it on a stand. Wouldn't mind displaying this next to the shuttle. Is there a spot to insert a stand? I can't locate an email address to buy instructions from you, where do I find that? I did a quick price test and changed most of the red (non-visible parts) to either gray or black depending on what is more common and likely cheaper. Bricklink found a combo of I think 7 stores for a grand total of $370. That was new or used parts. Good question. 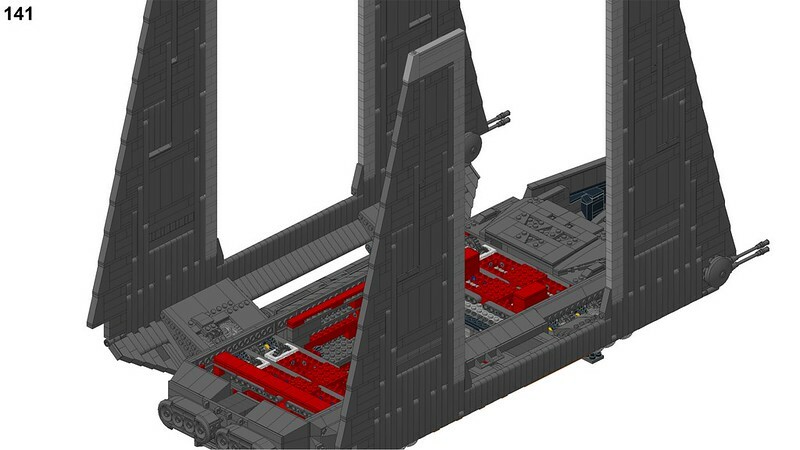 I had a look at the 10212 instructions, where the stand has a pyramid that fits into a 4x6 hole in the shuttle, whilst supporting the underside. The first steps for my model lays down a row of (x7) 6x6 plates with 2x10 plate 'ribbing' across them (middle of the ship here). Only the rear five are accessible (as the ladder area is built over the front two), so in theory a couple could be taken out, reinforced, and made to fit two 10212 type stands. You would need a lot of space to display it in flight mode, but it could be done. I never attempted this as I don't even have a stand (yet) for my bricklinked 10212. The flat underside has a surface area of 42 x 10, which should be enough to spread and balance the load. (x4) 75535 are needed in Dark Bluish Grey for the wings (page 560), but as they are somewhat rare you could use (x8) 18654 instead. (x8) are needed when fitting the wings (page 686), but I suggest using 62462 Flat Silver (very common colour). The Dark Bluish Grey slope 30 1 x 2 x 2/3 should have this print. So you only need (x38) for the rest of the model. uh, recent price part superseeds 500 USD on used parts alone.... HOW!!!! And with this manual you have fulfilled the wishes of many AFOLs, will definitely be building this in the future! Did not like the used parts. Now all visible parts will be new. This is great. I would buy if I actually had money?? Almost all parts are there. Waiting for 2 more orders. I like the room an adult playground for sure.Some very nice builds in there.